Studio art is a degree for developing the best practices of contemporary artists and designers. Students in the three media concentrations join for a two-semester interdisciplinary studio to develop group projects and a body of work and a senior seminar on professional practices for artists such as creating presentation materials and writing grants and artist’s statements. Students in graphic design take a senior seminar on professional practices and develop a portfolio to show prospective employers and clients. 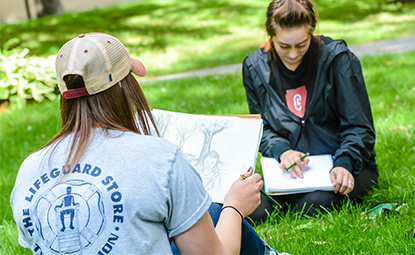 Studio art majors select one of the following concentrations in which to develop their skills, push their conceptual abilities and expand their creativity. Graphic Design: Visual communication through typography and images. 2D Media: Drawing, painting and printmaking. 3D Media: Sculpture and ceramics using classic and experimental technologies. Integrated Media: Art created through new and emerging technologies. Kiehle Visual Arts Center houses ceramics, wet-based photography and printmaking; large studio classrooms for painting, drawing, sculpture, and art education; student studios; a woodshop; a metal shop; and several large computer labs and a digital project lab that support graphic design, digital photography, video, and multimedia. Faculty includes two Fulbright fellows, five McKnight fellows, three Bush fellows, and one Joan Mitchell Foundation fellow.